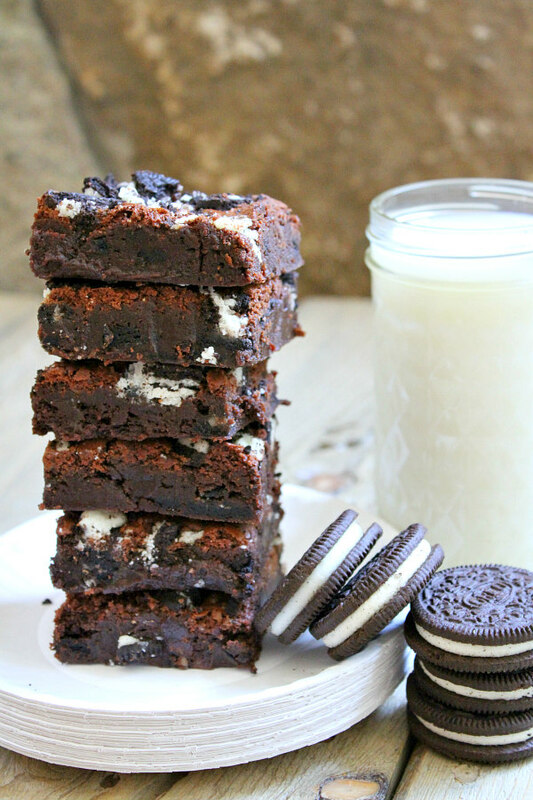 These are really the Best Oreo Brownies on the internet. Truth! Hi, it’s RecipeGirl here blogging today for my son Brooks (RecipeBoy). He is knee-deep in studying for end-of-sophomore year finals, his varsity lacrosse team has made it to the state finals this weekend… and his 16th birthday is this weekend! There is a lot going on! 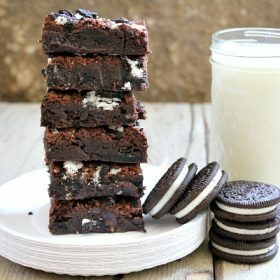 Since these are Brooks’ all-time favorite brownies, I thought I’d share the recipe with you today. He asks me to bake them every single time his friends come over. They are always a huge hit! Here’s what our RecipeBoy Brooks looks like now. He started blogging when he was just 10 years old (is there anyone out there who has followed him since the beginning?) So he’s had a strong 6 years of sharing recipes and stories on this blog. That’s pretty incredible for a kid his age, isn’t it? Here is his first post ever if anyone is interested in going back and taking a peek > HOW TO MAKE A SHIRLEY TEMPLE. 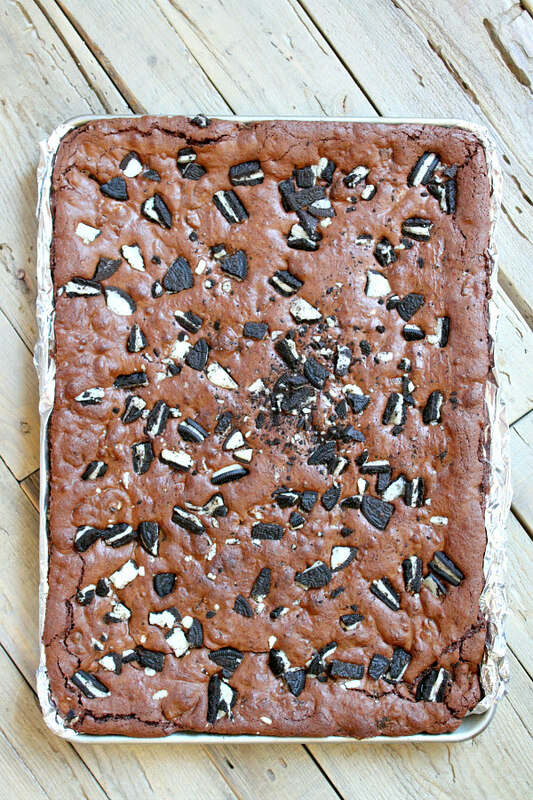 These brownies are baked in a large sheet pan. 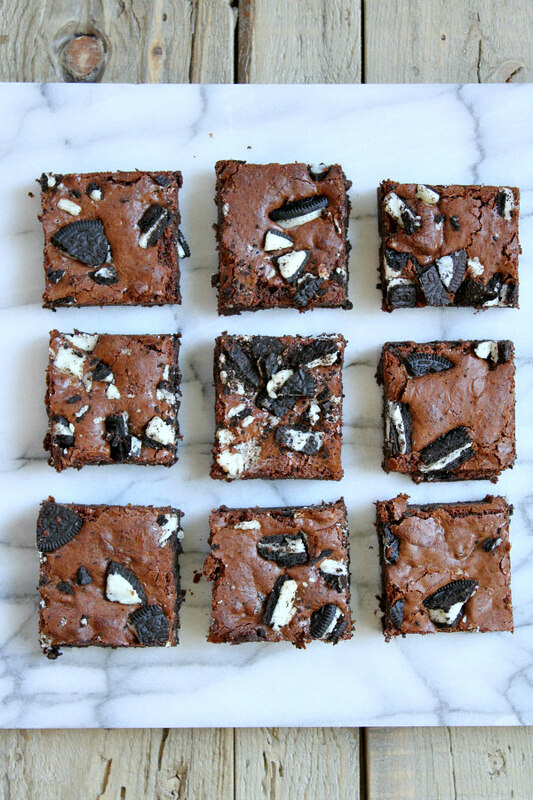 This is the perfect brownie recipe to make if you have a ton of people coming over. The recipe makes 40 brownies! 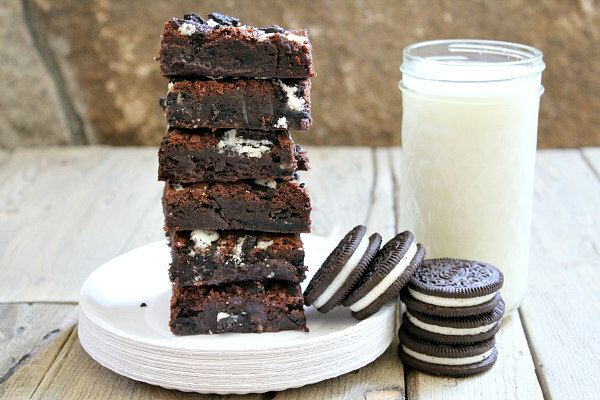 Rest assured that every brownie will come out fudgy and full of chunks of Double Stuff Oreos. They’re a sturdy brownie too. They won’t be falling apart in your hands as you eat them. I suggest having plenty of milk nearby. They’re very chocolatey and fudgy! If you decide to try them, come back to this post and comment to tell Brooks how much you like them too. 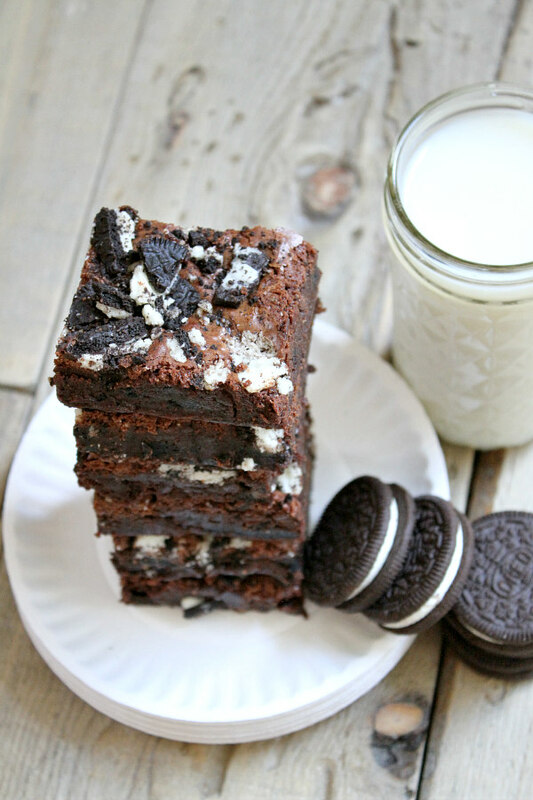 He’ll be happy to know that others have jumped on the Oreo Brownie bandwagon. 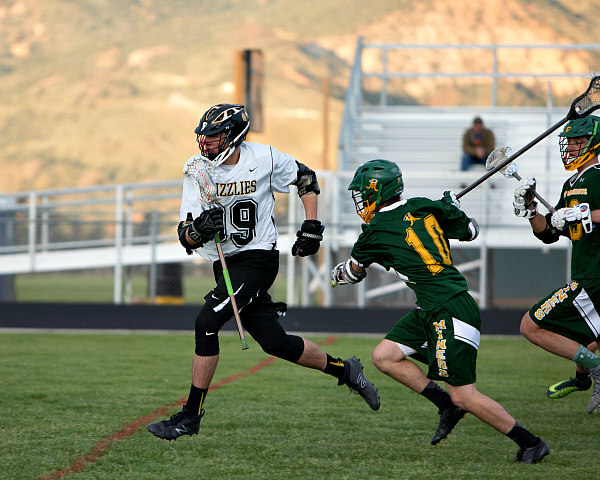 Here’s a peek at what Brooks looks like on the lacrosse field. He’s a tall (6’4″), big kid, and he’s so talented on the field. For those of you who know lacrosse, he starts for his team as Face-Off Middie. This season he has played strong, won many face-offs and has assisted and scored many goals. So proud of this kid! 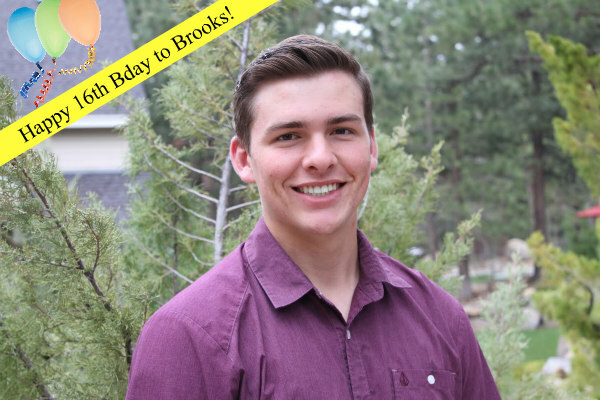 Happy 16th birthday Brooks! And Happy 6th birthday to RecipeBoy.com! Preheat the oven to 350°F. Spray a 13x18x1-inch sheet pan with nonstick spray. Line with foil or parchment that hangs over the sides, then spray the foil/parchment with nonstick spray. In the microwave or a small saucepan over low heat, melt the butter and chocolates and whisk until smooth; set aside to cool. In a large bowl, whisk together the eggs, espresso powder, vanilla and sugar. Gradually add the slightly cooled chocolate mixture to the egg mixture, whisking constantly. In a medium bowl, whisk together the flour, baking powder, and salt, then add to the chocolate batter. Stir most of the broken cookies into the chocolate mixture (save a few for sprinkling on top). Then pour the brownie batter into the prepared baking pan and smooth the top with a rubber spatula. Sprinkle any reserved brownie pieces on top.